AED classes in Connecticut take just a few short hours to complete, but can make all the difference to those in need. After all, the average response time for first responders once 911 is called is 8-12 minutes. For each minute defibrillation is delayed, the chance of survival reduces by approximately 10%. Fortunately, with online, in-person, or blended AED training from the American Red Cross, you can learn the skills that can help save a life. 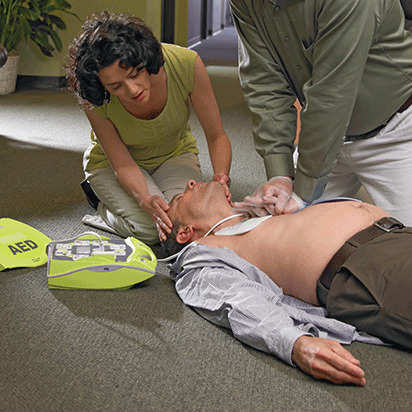 Developed to mirror a traditional learning environment, the Red Cross's in-person AED classes in Connecticut allow you to learn how to use an automated external defibrillator under the guidance of trained, local experts. Combining lecture with hands-on skills sessions, these courses give you time to ask questions and work through problems as a team while learning the latest techniques. Even after taking Red Cross AED classes in Connecticut, remembering your skills can be a challenge, particularly if you don't use them regularly. To help keep your skills sharp and your memory fresh, we've developed a quick step-by-step guide that you can print up and place in a binder, on your refrigerator, at your desk or in your bag, and refer to whenever, wherever you need to. At The American Red Cross, we know how important it is to create a safe environment for your students and your faculty. That's why we've developed a training program just for schools. With our specially designed program, your school's educators and administrators can learn to teach Connecticut AED certification classes, then deliver training to students and faculty. This way, you can create an on-campus community that will be ready to help when it's needed most. With our Connecticut AED classes for healthcare providers, we can help you stay abreast of the latest protocols, maintain your certifications and provide life-saving care when every moment counts. Classes are available in person and via our blended Simulation Learning experience, which gives you the opportunity to complete your coursework online, then demonstrate your skills to a certified instructor. Both types of courses offer full certification that's valid for two years. At the Red Cross we believe in empowering you to provide care when it's needed most. In order to make sure that you receive the training you need to confidently help during times of crisis, all Red Cross classes, including our AED classes in Connecticut, are developed under the guidance of, and reviewed by, the Red Cross Scientific Advisory Council. Comprised of more than 50 nationally-recognized medical, scientific, and academic experts, the Council works to ensure that Red Cross programs and materials are not only based on the best science available, but that they're also effective and easy to understand.